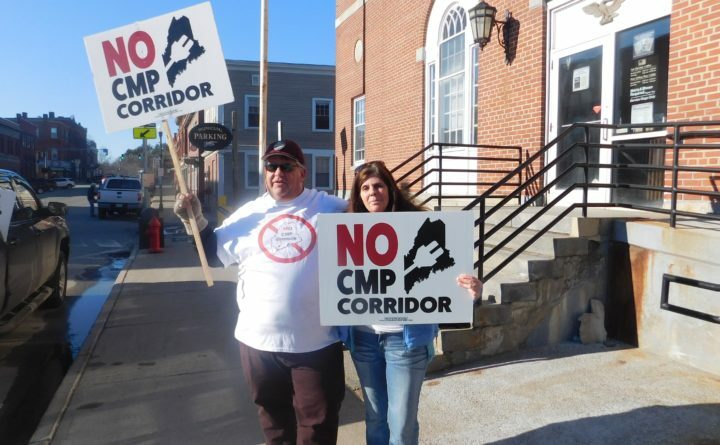 Darryl Wood and Theresa York, both residents of Farmington, demonstrate in front of the post office on Main Street on March 25, 2019, against the Central Maine Power electricity corridor that will pass through their town. Much of the Legislature’s business today will pause for the funeral service of a fallen Maine State Police detective as regulators speed toward a decision on Central Maine Power’s corridor proposal and lawmakers advance child welfare overhauls. The Maine Public Utilities Commission has scheduled a special meeting to consider the $1 billion corridor proposal on Thursday. The agency that regulates utilities added a special meeting to its calendar to consider the 145-mile transmission line through western Maine that would deliver Quebec hydropower to Massachusetts. It is backed by Gov. Janet Mills after parties inked a $250 million, 40-year benefits package and the staff of the commission issued a report last month saying the project is in the public interest. It hasn’t suffered so far despite a lack of grassroots support. Farmington recently joined several other towns to oppose it and a poll from opponents showed wide opposition across Maine. Responses to the commission’s report were due on Monday, which led former Maine Public Utilities Commissioner David Littell to tweet that the Thursday meeting left a “short time” to consider comments and concerns filed by proponents and opponents. Permitting processes are ongoing before the Department of Environmental Protection and another state agency. The Legislature is considering several bills that could neuter or delay the project, including one from Rep. Seth Berry, D-Bowdoinham, that would make every town the corridor passes through approve it at referendum before it is built. That will get a public hearing before a legislative committee on Wednesday. The Maine Department of Health and Human Services advanced internal overhauls to child welfare policy and more could be on the way from the Legislature. Under former Gov. Paul LePage, the department and lawmakers advanced changes to Maine’s child welfare system last year amid investigations and uproar into the deaths of Kendall Chick and Marissa Kennedy. A second wave of changes is now afoot under Mills after the state released data to the Bangor Daily News showing more than 20 children died since 2017 amid concerns for their safety. Most of those deaths were deemed accidents and eight of those were co-sleeping incidents. The department announced on Monday that it’s launching social media and advertising campaigns aimed at education around safe sleeping with children and offering extra home visits to parents in Maine with children younger than 2. A legislative committee also endorsed a bill from Rep. Colleen Madigan, D-Waterville, on Monday that would put the department to work examining caseload limits for child welfare workers. The Legislature is also considering a new committee dedicated to child welfare issues. The House and Senate won’t hold Tuesday floor sessions to allow lawmakers to attend the memorial service for the Maine State Police detective who died last week. Thousands are expected at Portland’s Cross Insurance Arena for the 11 a.m. service for Benjamin Campbell of Millinocket, who died last week when he was hit by a tire that separated from a logging truck while he aided a motorist on Interstate 95 in Hampden. Legislative committees are still scheduled to meet, but those plans could change. For now, public hearings are scheduled on bills making K-12 assessments optional. — A Maine woman has been arrested for allegedly sending a threatening letter to the state’s senior senator. Burlington resident Suzanne E. Muscara, 37, was arrested Friday for allegedly mailing a letter that contained a white powder that the sender claimed was anthrax. The letter, which was addressed to Sen. Susan Collins at her Bangor home, was intercepted at the U.S. Postal Service’s sorting facility in Hampden on Oct. 17, two days after Collins’ husband received a similar letter in the mail. The incident occurred amid uproar over Collins’ vote to confirm Supreme Court Justice Brett Kavanaugh. — Maine has updated the design of drivers’ licenses to conform with federal security requirements. Secretary of State Matt Dunlap unveiled the new design on Monday. The new design will replace the moose-and-mountain design adopted in 2010 by the Bureau of Motor Vehicles. The new design features an outline of the state of Maine, a white pine cone, a tassel and a black-capped chickadee, as well as iconic state imagery, including a potato field, lighthouse, sailboat, mountain and sunrise. More importantly, it will comply with federal Real ID standards, allowing Maine residents to use the licenses as identification to board domestic flights and enter other places for which the current design fails to meet Department of Homeland Security standards. — Maine’s independent U.S. senator complained that the IRS is targeting too many residents of Maine’s poorer counties for audits. Maine Public reports that Sen. Angus King, an independent who caucuses with Senate Democrats, complained that residents of Piscataquis and Washington counties are being unfairly chosen for tax audits because high percentages of residents of those counties qualify for earned-income tax credits. — Officials in the state’s largest city delayed a vote on whether to mandate paid sick leave. Maine Public reports that Portland city councilors decided to wait until absent Councilor Pious Ali, who supports the measure, could vote on it. They also are waiting for the Legislature to act on a bill that would create a statewide paid sick leave mandate. Like Bill Clinton, I didn’t inhale. But I still got kicked out of Fenway Park on Opening Day. It happened on drizzly early April day in 1988. A bartender from Massachusetts’ North Shore hired a bus each year to haul a few dozen reprobate Red Sox fans to Fenway to greet the season. It was a salve for the previous year’s heartbreak. Back in those days, every year ended in heartbreak for Red Sox fans. Our strategy was to guzzle as much beer as we could on the morning ride to the ballpark, so we would not get gouged for bad ballpark beer. At the time, it seemed reasonable, although heavy drinking before noon can impair one’s ability to make convincing legal arguments, as I learned that day. Tommy the bartender — like all good North Shore bartenders — had connections, which is why he was consistently able to secure a bloc of desirable tickets for Opening Day. We usually sat under the roof along the first base side — which is where we had engaged in a spirited snowball fight with the folks in the box seats a year or two earlier. But in 1988, Tommy hesitated just a bit too long, so we ended up with a few rows down the left-field line. Unfortunately, the seats were in Fenway’s newly designated “family area,” designed to shield young fans from the antics of unsavory characters like us. We took our seats and let the soporific effects of the morning booze cruise settle us into the zen-like state best suited for watching a pitchers’ duel between future Hall of Famer Jack Morris and future cheater Roger Clemens. A few innings into the game, someone down the row decided that zen-like state would be enhanced with a joint. In hindsight, it might have been an early attempt to use medical marijuana as preventive medicine for cirrhosis of the liver. In any case, the vessel made its way down the row to me. Resisting its siren song, I pinched it in my fingers and passed it along without imbibing. Really, I swear. But that did not convince the giant Boston College football players who had been hired to ensure family-like behavior in the family section. Two hulking neck-less linemen in red blazers instantly appeared behind me and the guy next to me. They insisted that we vacate the premises immediately. The injustice was great, but our valid claims of innocence went for naught. Like scuffed balls, we were tossed through the turnstiles, leaving us ticket-less, wet and scarred for life as among the first fans ejected from Friendly Fenway for being accomplices to harmless misbehavior that is now legal in the Bay State, Maine and many others. We thought about trying to sneak back in, but the rain was coming down harder, it was getting colder and — as was often the case in those days — I knew of a good bar nearby. So we trundled down to Kenmore Square and watched the rest of the game on TV from the warmth of the bar at The Rat, where we sipped better beer and ate helmets full of fries until new Red Sox closer — and future Hall of Famer — Lee Smith gave up a game-winning home run in his Boston debut. We made it back to the bus, where we snoozed warm and content as the rest of the crew shivered and tried to dry out — in more ways than one. To reach us, do not reply directly to this newsletter, but email us directly at mshepherd@bangordailynews.com and rlong@bangordailynews.com.